With beautiful embroidery. Since 2004 we have established ourselves as experts at converting your logo to beautiful embroidery, then stitching it onto quality apparel. STEP 1 - select your apparel from our online catalog and email us your logo lisa@venturaembroidery.com. The better the file, the better the embroidery so we recommend a high resolution vector file (300 dpi). STEP 2 - we will email you a quote and request a deposit; you may visit the shop or call us with your credit card 805.654.0194. STEP 3 - we will create and stitch out a sample embroidery. Once approved we will embroidery the jackets, shirts, caps, aprons, whatever you selected from the catalog. Purchase your apparel from Custom Embroidery and embroidery is LESS! If you need the embroidery in less than 7 days - special pricing applies. 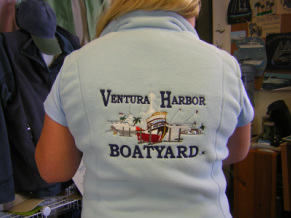 In 2004 we started Embroidery for Boaters by a Boater! Fifteen years later we have expanded to include Screen Printing, Banners, Sublimation, Photo Gifts, and more. Just ask - we welcome your business!